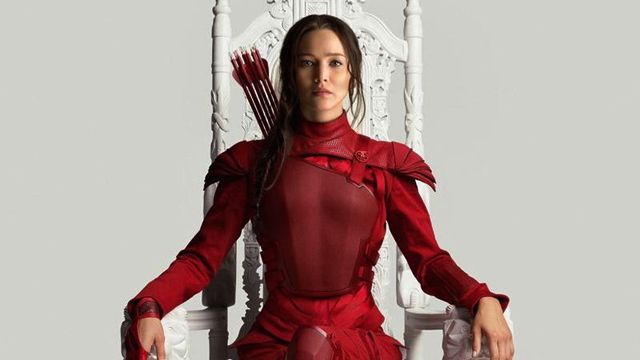 It’s been a few years and a bumpy ride for heroine Katniss Everdeen (Jennifer Lawrence), but the dystopian teen phenomenon finally wraps up later this year when The Hunger Games: Mockingjay—Part 2 storms theaters like a horde of rebels attacking a fictional city. Just in case you forgot how intense this is going to be, this new trailer reminds you of just that. Mockingjay—Part 1 is flat, doesn’t ever build to much, and is primarily prologue to the action in Part 2, but when put together, the two should, hopefully, form one solid movie. All the pressure, all the posturing, all the revolutionary rhetoric and propaganda, finally comes to fruition in this film at Katniss, Peeta (Josh Hutcherson), male Gale (Liam Hemsworth), and the rest of the residents of the brow-beaten dystopia of Panem finally rise up once and to topple the Capital and the nefarious President Snow (Donald Sutherland). Mockingjay, the third book in Suzanne Collins’ best-selling trilogy, doesn’t have a traditional Hunger Games, but this trailer goes out of its way to drive home the metaphorical Hunger Games aspect of the story, just in case you missed that. The book is the weakest of the trilogy, but we’re optimistic that doesn’t translate to the screen. This looks like the culmination all of the rebellion, both subtle and obvious, packed with gorgeous, inventive sci-fi action, and that’s worth getting excited about. The Hunger Games: Mockingjay—Part 2 rises up on November 20.